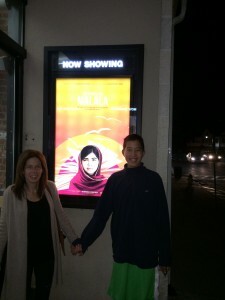 Malala Yousafzai is my hero. I went to see her movie today at the Jacob Burns Center. She has inspired me to continue to do good for this world. If someone like Malala can make a difference (against all odds), then why can’t some 13 year old kid named Jake Gallin do something to make a difference. I have always dreamed of meeting Malala one day. She has been a role model to me, ever since I first heard of her.